Our coaches at Bad Axe have taught many people how to throw axes. Although earlier this month we had the pleasure of hosting a special guest, Marc Venema from CTV News Kitchener. Marc paid us a visit at Bad Axe Throwing Kitchener and learned how to throw an axe for the first time! 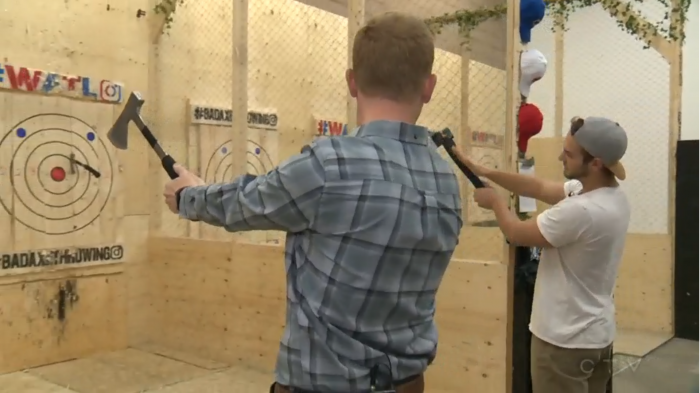 Our Axe Master at Bad Axe Throwing Kitchener, Matt Belanger shows Marc the ropes. Like Marc, most of our customers are first time axe throwers. Axe Master, Matt Belanger takes Marc through the steps of learning to throw an axe and perfecting his new skill. Not long after, Marc channels his inner lumberjack skills and hits a bullseye! If you’d like to book your axe throwing event with Axe Master Matt in Kitchener, visit our website and book online!